Visual Studio Code>Programming Languages>NotesNew to Visual Studio Code? Get it now. Syntax highlighting for notes, with simple TODO lists. Also allows you to cross-link (cmd-click) between notes. 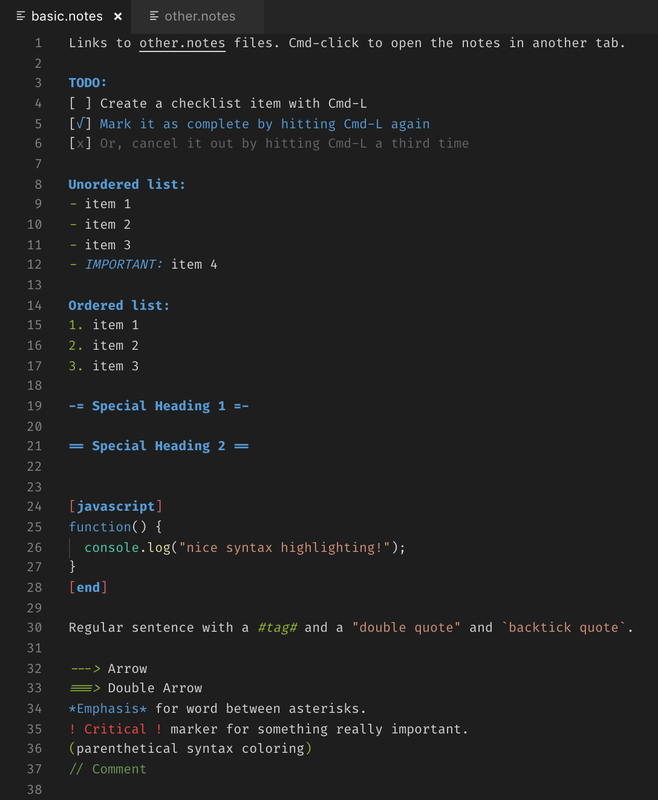 Syntax highlighting based on Sublime Text Notes by tbh1. When the cursor is on a line with a TODO checkbox, subsequent cmd+L directives will cycle through [√] (done) and [x] (won't do). If you mention another *.notes file, it will be underlined and become a hyperlink: work.notes. To follow the link, use the vscode cmd+click standard feature. References to notes can be absolute or relative; if relative, they are relative to the current document. If the notes file you'd like to link to contains spaces, you can use "double quotes" to indicate the spaces should be included in the hyperlink. You can also use tilde (~) to mean your home directory, e.g. ~Notes/journal.notes.